I was featured today on a cool local website titled: Triad Moms on Main, its a wonderful site featuring great blog posts, local events for families, shopping, giveaways, travel, health and food. If your in the NC Triad area be sure to check it out. I love local sites in fact when I first moved it was local moms sites that hooked me into playdate's and allowed me to make the wonderful friends I have here. What are your favorite local sites where you live? Thanks for the mention, Rebecca! Your profile is a hit on our site. 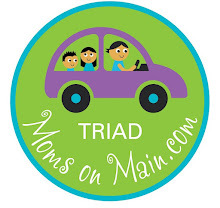 Also know we have a partner site in the Triangle (Raleigh, Durham, Chapel Hill) - www.TriangleMomsOnMain.com. Thanks for all you do! Congratulations Rebecca...you are a hit on that site too....great!!! congrats on featuring on nice website. You are talented. So glad to see you featured again. You deserve it. Visiting from TMoM today! Loved reading your profile. I will be back! There are not many local sites in English where I live...so I made this: www.livingatlajes.wordpress.com I have gotten lots of positive feedback on this, including the dept of tourism as a friend (local Portuguese) of mine showed them the site and he wrote about it on their blog. So cool that you go to write on their site. You are certainly getting around these days. BTW dinner was great tonight. Loved the soup. The color scared Ryan at first but he ended up liking the flavor. How cool to be featured on their site Rebecca. Big congratulations. Congrats on your feature. This is a wonderful way to meet people. Very cool. What a great article. Congratulations on being featured!! I think it's so cool that you created an app for your site/recipes. Is that something you have a knack for, or was it stretching yourself and new to learn? I'm interested in the Blog Talk radio you host...is this a podcast I can find? Fill me in! Thanks!! saw it on fb - congrats woman - you deserve it! A great post, love ur space ! Very cool! I need to find a site like this in my area.